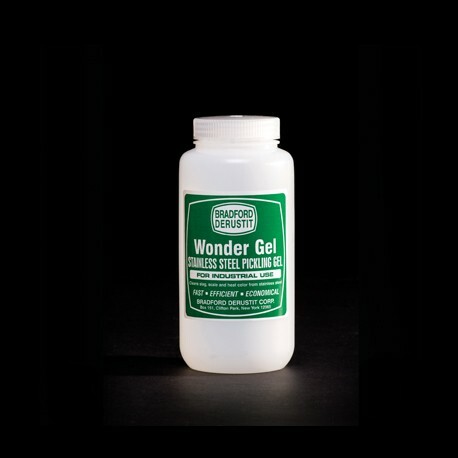 Wonder Gel - 1 qt by Bradford Derustit Corp.
***Shipments to PR cannot ship via UPS Ground. Please be sure to select an Air option only. Manufactured by: Bradford Derustit Corp.
Wonder Gel is a new formulation that is powerful, fast-acting and simple to use. No mixing or measuring - apply industrial strength Wonder Gel directly to surfaces to remove stubborn impurities. Wonder Gel cleans the toughest slag, scale and heat color from stainless steel. Removes weld scale, black oxides and discoloration from the surface of stainless steel. Restores the protective chromium oxide layer. Pickling: Removes oxides, scale and other impurities from stainless steel surfaces. Passivation: Gives stainless steel surfaces a protective surface to resist corrosion. Wonder Gel is a superior pickling gel that thoroughly removes rust, oxides, scale and other impurities from stainless steel surfaces. A carefully balanced formulation of effective pickling agents combined with special inhibitors, Wonder Gel removes impurities and corrosion. The staff at Bradford Derustit is available to help solve your metal surface cleaning problems. © 2019 Bradford Derustit - All rights reserved.